Protect your home, health, and appliances by sterilizing your water. The Express Water Ultraviolet Sterilizer removes major contaminants from your water and provides sterilized water all home uses. The UV removes up to 99% of biological contaminants like Salmonella, Fungi, Aspergillus, E. Coli, Cysts, Legionella, Microorganisms, Dysentery, Coliform, Giardia, Mold, Cryptosporidium, Algae, other viruses, and other bacteria. Start drinking healthy and stop drinking contaminants with your own home Ultraviolet Sterilizer. 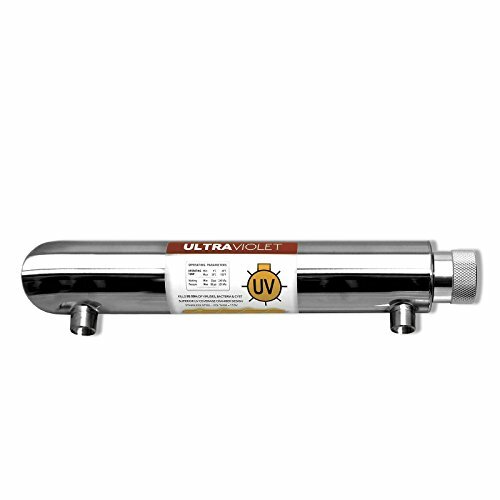 The UV Sterilizer is good for 6 months to 1 year of use and features a monitoring system to alert you when the power of the UV bulb falls below germicidal range. A red light on the ballast will activate once the bulb needs to be replaced and will sound a beep. The life is based on average water quality. Your bulb life may be different depending on your water quality, temperature, and incoming pressure.